When Kim Brook was a boy of eight, his world changed. Along with his family, he was uprooted from Monmouth in south Wales to Germany, where his father Colonel Walter Brook, was tasked with helping re-build the devastated country post World War Two. Young Kim, along with his older siblings, was told "not to be friendly" with the Germans, and that they were "different". But, ignoring orders, he soon began having snowball fights and making friends. His parents too, rebuked orders, refusing to requisition a house from a German family, and instead deciding to share it with them. The family story was recorded by Kim's son, Rhidian Brook, in a novel The Aftermath, published in 2013. It has now been released as a film, with actress Keira Knightley starring as Rachel, a character loosely inspired by Kim's late mother, Anthea. "I am very proud of my son, Rhidian, for writing this story and recording our family history," said Kim, now 80 and living in Brecon. "But I am also so proud of my parents. "They had a Welsh heritage and they took this welcoming and generous spirit with them to Germany." Much of the book and film focuses on the character of Kim's dad Walter - Lewis in the film. Born in 1895, Walter grew up on a farm near Presteigne, Powys. He was stationed in Egypt and Arabia during World War One, becoming friends with T.E Lawrence - Lawrence of Arabia - who impressed Walter with the way he managed to unite the Arabs. During World War Two, Walter was then tasked with contributing to the rebuilding of government in Germany once the war was over. Kim said: "I remember he sent home lots of letters and photos. "I also saw pictures in weekly magazines of the Bergen-Belsen concentration camp, so I knew a bit of what to expect." Still, arriving in Hamburg - recently completely destroyed by a strategic bombing campaign by the Allies - was a shock. "I recall meeting with dad, then being driven through miles of ruins," he said. "There was literally nothing standing, and lots of the ruins had black crosses on them, marking the dead bodies. "The desperation and starvation was in your face." As the Allies were determined no former Nazis were going to be in positions of responsibility, Walter was installed as Governor to Pinneburg, a district just west of the city of Hamburg. He was given use of a local mansion, but instead of ordering the German owners to leave, instead opted to share the property with businessman Wilhelm Ladiges, his wife Erika, daughter Heike, seven, and sons Theo, 12 and Holger, five. The Ladiges had the first floor and the Brooks the ground floor, but both families shared a kitchen in the basement. Kim recalls: "We were told not to really talk to the Ladiges, even though they had been as anti-Hitler as anyone dared during the war. "We were meant to display dignified curtness, but it was an extremely cold winter, so we wanted to have snowball fights. "I soon learnt German and began to play with Heike in the countryside. We climbed trees and played hopscotch." His ability to break down barriers earned him the nickname Der Eisbrecher or the ice-breaker. But it wasn't just the children who formed relationships. Kim said: "During Christmas 1947, I remember us children dressing up in sheets and the two families singing Silent Night in German around the tree. "Both sets of parents had tears rolling down their cheeks and, after that, the relationship moved on with greater warmth and understanding." Once warmer weather arrived, the Brooks began taking Heike with them on their trips to the seaside. Kim said: "It wasn't allowed, so she had to hide in the car's footwell in case we bumped into military police. "But she was treated as an equal, and this was important. We weren't quite so nice to the kids we knew had been members of the Hitler Youth." 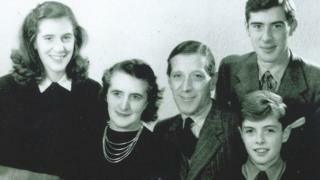 In total, Kim lived in Germany for four and a half years, returning to Britain for boarding school aged 13, with the whole family leaving in 1951. He and Heike remained pen pals, but it was 15 years before they saw each other again. By then, they were both married with children of their own. These children, on both sides, heard stories of their parents' unusual upbringing, but it was Rhidian, 54, Kim's eldest son, who put pen to paper. The film rights were subsequently bought, but the plot is very different to the real story, containing fictional affairs and assassination attempts. Kim said: "We travelled to Germany to see some of the filming. "We met Keira Knightly and the actors Alexander Skarsgard and Jason Clarke. "They were so nice to us, and intrigued to hear the real story." Kim, who still speaks German, also remains in contact with Heike. He said: "She doesn't resent the fact that British moved into her home. "It is clear she admired my father and was fond of us. "My dad always used to say he wasn't interested in revenge or retribution. "His job was to rebuild and to create reconciliation." Rhidian, 54, said he wanted to write the story to celebrate those forgotten in history books. He said: "I am a novelist and enjoy fiction, so I took the original story and reinvented it. "I wanted to imagine what a woman - like my grandmother - might have felt having to share a house with a German family and follow her journey from resentment and prejudice to acceptance and understanding." He added: "All too often, history records the battles and tanks and the names of the generals of war. "To me, though, I wanted to record the unsung peacemakers and the people who put things back together. "Both the book and film are about how people and cities and infrastructure are mended when they are broken. "This bit of history is constructive, not destructive, but it is just as important." Should Alderney make its wartime camps tourist attractions?